The pictures below are taken from various internal parts of the chamber and the surface of the lens from Canon camera and Canon lens. They illustrate that in this particular case Canon uses a soft fabric like Velcro to cover the chamber area in order for the dust to anchor itself to it. This helps greatly with long fibers that have many contact points, but smaller fibers or particles with less number of contact points will come off more readily with camera shake eventually falling off on the sensor. This preventive method from Canon works great until it reaches maximum capacity. Imagine slowly filling a glass of water. The glass works fine in holding the water until it is full. After that, where does the water go? Over the edge, of course! Same priniciple applies in this case. Once the fabric is saturated, all other dust or fiber particles will simply fall off onto the sensor. However, removing the particles through regular cleaning will increase the probability of your sensor being clean by preventing particles from falling off the chamber walls. It will make these so called anchoring places more effective as future dust traps. 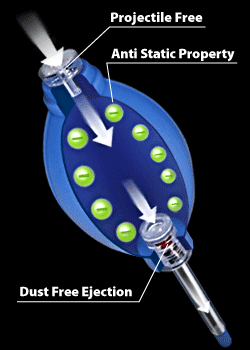 Using the 8mm Sensor Brush® (Chamber cleaning brush) and Chamber Clean™ solution will greatly enhance the removal of these particles. It is highly recommended not to use the same brush as the one used on the sensor to clean the chamber and lenses to minimize the risk of smear and contamination.